Posted 10:07 am by Jonny Pigg & filed under Gig. 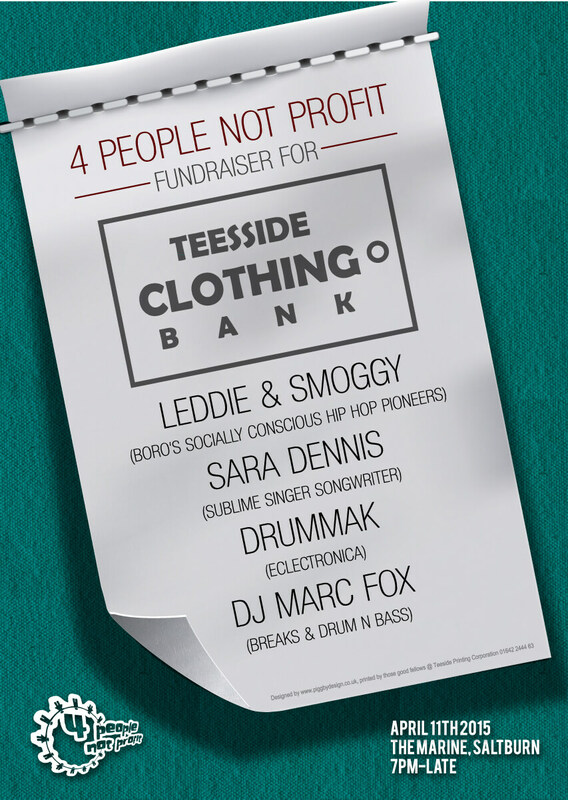 4 People Not Profit is back on Saturday April 11th for yet another fantastic party night and fundraiser for the newly formed Teesside Socialist Clothing Bank (TSCB). As part of the response to poverty creating policies TSCB aims to challenge the political roots of the social crisis. TSCB provides monthly access to clothing, shoes and toiletries for anyone in need, no referral or evidence of need required. Based at The Newport Hub on the 2nd Saturday of every month from 1-3pm, clean and good quality clothes, advice and guidance, hot food and drinks and various activities and entertainment in a safe family and community setting. Donations of clothes so far have been extremely generous and at present no more can be taken. TSCB do however need cash for running costs such as rent for the building, new underwear, food & drink and storage solutions- this is where you lovely generous people come in and join 4 People Not Profit to Party! Our headliner was to be Leddie and Smoggy (social conscious hip hop from Boro) but due to unforseen work issues they have had to drop out. But to be confirmed Smoggy may play a solo set? In replacement we have the comedy music set from the hilarious Elvis Herod!